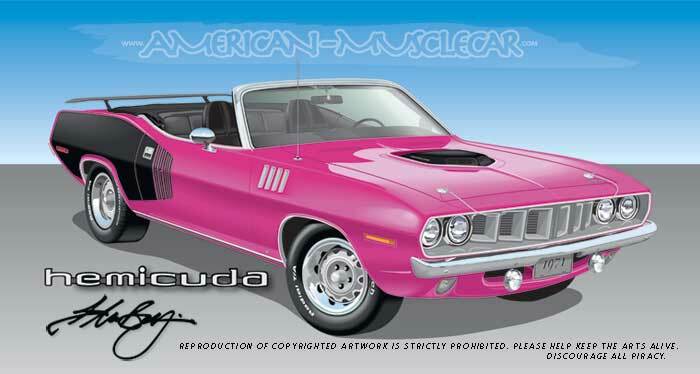 American-Musclecar.com is the home of the finest full-color artwork created exclusively for 2-door Mopar Musclecars from the 60's & 70's. Nearly 40 hours of illustration time goes into each musclecar rendering and from that artwork I am able to recreate your exact mopar musclecar from your list of options at an affordable price. Whether your car is being restored, on display somewhere or has been lost to the past, I can rebuild your showroom appearing car right down to the bumper guards, usually without a photograph. Each illustration is hand-built using my predrawn parts. I take your list of options and build your car exactly as you want it - Concours correct or with your own personal touch including options not normally available for your car when it was ordered back in the day. 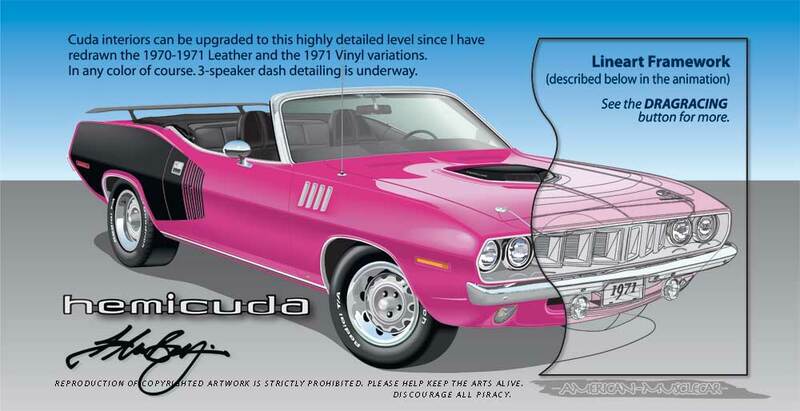 You can order a '70 AAR Cuda convertible print if you like (something that could not be ordered from ma’ mopar in 1970). When you receive your full-color fineart print you will be able to enjoy the fabulous detail put into every drawing. Everything on the car has been drawn with exacting detail and amazing clarity. Take advantage of the many printing options available because the larger the print size the easier it is to see all the amazing details. 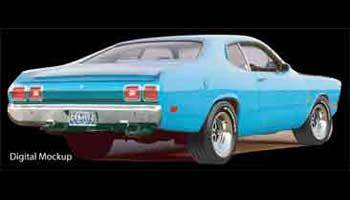 Navigate around and you'll find hundreds of custom orders of Cudas, Challengers, AAR Cudas, T/As, Chargers, Roadrunners, GTXs, Superbirds, Daytonas, Dusters, Darts, Demons, R/Ts, Superbees, and Satellites. I am still drawing sheet metal for A-Body cars and a couple B-Body cars like the ‘71-’74 Chargers, the ‘71 & ’72 Superbees, and the '69 Superbee. You are welcome to place your order for these cars or you can commission the project (see the pricing link). Check out the Stock Art page for less expensive artwork options! There are lots of new things coming soon so keep a close watch-freebees come along every once in a while.